My daughter's love of art carries over into every arena, and she's just starting to get into fancy writing too. She loved a book I got to review, The Complete Photo Guide to Hand Lettering and Calligraphy. The book bills itself as "the essential reference for novice and expert letterers and calligraphers." I know that for newbies like her (and myself) there was a ton of information here - but because every author has a different style, it's going to have new information even for experienced artists. The book is very clear regarding tips and equipment. 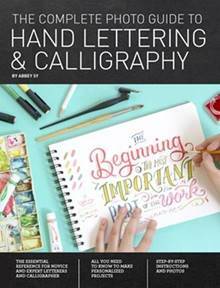 It also provides tangible, step-by-step ways to practice different styles, to improve anyone's technique. It even touches on digital tools. The writing styles are beautiful and appropriate for letters, sign-making, and gifts.